All of us should know by now DNA testing is definitely not a case where "one size fits all." Judy knew this and she provided many viable options, but she left one out and I believe she did that on purpose. We will get back to what her purpose may have been later in this post. In the last several days I have been approached three times by individuals asking what DNA test I would recommend for gaining health related information. Two wish to self test and the other is looking for holiday gift ideas for two sons. All of the would-be test takers are middle-aged. If they test they would become the kind of test takers all serious genetic genealogists love to hate. They all know little and claim no interest in knowing more about their ancestry except for how their genes may impact their own health. In addition they all claim not to be concerned about their carrier status for diseases that the FDA now permits 23andMe to report to clients. That really doesn't leave much from which to choose. Some information about prescription drug interactions with an individual's genome can purchased through a test offered by Healthspek which I have discussed in previous posts. However, that is only one part of the health related information inquiring minds would like to know about what is recorded within their personal genomes. Several years ago I took a quick look at Promethease but found it to be not as user friendly as similar information presented by 23andMe. Since the reports generated by both companies were coming from the same source data, I opted to concentrate on those on my site at 23andMe. During the holiday season three years ago we offered to gift our children and their significant others with 23andMe test kits. One of the things we learned from this was that both one son and his wife were carriers for hemochromatosis -- which causes one's body to accumulate too much iron. The parents were not flagged as being at risk for developing this disorder but their offspring -- our young grandchildren -- were at elevated risk. I discussed this finding with my daughter-in-law who is a gynecological surgeon and medical school faculty member. I recommended that she relay this information to the boys' pediatrician so that he could make note of it in their files and monitor this possibility. My MD daughter-in-law asked if I would write a long email to the pediatrician that explained this development to him. I did so but I found this to be ironic (pun intended) since I'm an information doctor not a medical professional. Some of you know that I have never had a biological science course of any description in my life. My insatiable curiosity about DNA was God's punishment of me when She read my transcript and realized my academic deficiency. So much for needing medical professionals to protect and guide us uninitiated civilians as we are introduced to the information in our own genomes. But I digress. Back in September The Legal Genealogist wrote "A Healthy Choice" as a post to her popular blog. In it she presented a very thorough introduction to Promethease as a source for health related information from our genes. Rather than trying to repeat her succinct prose my intent is to expand on the personal experiment she reported. Until recently I was unaware that self downloaded raw atDNA results from any of the big three testing companies can be uploaded and processed through Promethease. However, the 23andMe test chip has significantly more health related SNPs than the chips of the other two companies. FTDNA has made conscious decision to stay away to the extent possible from SNPs thought to be health related. This decision was made years ago in order to minimize the potential for regulatory problems with the FDA. As we learn more about our genomes, it is increasingly difficult to avoid SNPs with known health consequences. Ancestry discloses little about its rationale for selecting the SNPs on its chip. Clearly customers get reports on about twice as many SNPs from 23andMe raw data than from the data from competitors. My little study has replicated Judy's. So if your only objective in taking an autosomal DNA test is to learn more about how your genetic component may contribute your future health, 23andMe raw data will give you more to analyze and analyze and analyze. That is what you will be doing if you go this route. Processing raw data from 23andMe or Ancestry only costs $5. Family Finder data costs $7 because xDNA must be downloaded separately and added to the mix to get the most complete picture that can be extracted from those data. If you have raw data from all three companies as does The Legal Genealogist and Dr. D., all your data can be loaded into Promethease at one time and processed for a total of $11. It is easy to drown in the data. 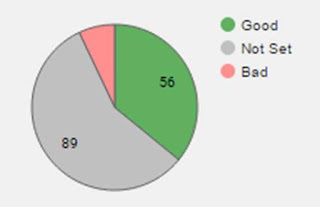 In my own report Alzheimer's was associated with 156 SNPs: 56 good; 11 bad and 89 with small associations that have yet to be classified as either good or bad. You cannot look at the predictive power of a single SNP and be confident that you know something about how your genome may affect your future health. The human genome is far to complex for this kind of intellectual short cut. If you have that obsessive-compulsive gene and love to pour over all the known data, this may be the test for you. If you have already done an atDNA test, for an additional investment of only $5 or $11 dollars, you can entertain yourself all night! As most of you know 23andMe recently raised the price of its test kit to $199 for U.S. customers. If you are already a 23andMe customer, you recently should have received an offer to order kits for $149. This price is good for purchases completed through 11:59 pm PST on January 8, 2016. What you may not have noticed in the fine print is that you can place up to three separate orders. Each order can be for up to ten kits. This allows one to order as many as thirty kits at this sale price. If you are at all interested in using DNA testing to learn ancestry information for genealogical purposes, read Judy's December 6th blog post "Now... and not now" before you order any kit from 23andMe. Ancestry to drop Family Tree Maker software. 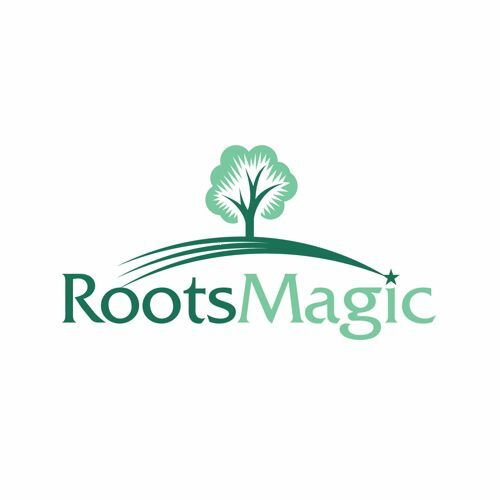 RootsMagic benefits? The Ancestry blog announced today that the company would stop selling its desktop software program Family Tree Maker (FTM) as of the last day of this month. The company says it will continue to support current owners of Family Tree Maker at least through January 1, 2017. If the past is any guide to the present, it will be a waste of time for the genealogical community to try to influence Ancestry to reverse course on this matter. This behavior, while it may make business sense, does not enamor customers to trust Ancestry to be there for them in the long run. Ancestry has a history of buying or acquiring products and then abandoning them often with the loss of massive amounts of useful data lost in the process. I was a user of FTM once upon a time. Then I moved to Family Origins. At the time I was thrilled because I thought this would mean Ancestry's marketing know how would increase the reach of Family Origins. WRONG. In retrospect it appears that Family Origins was acquired to get rid of competition for FTM. Family Origins was allowed to die a quiet death. 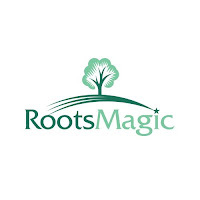 Fortunately the programming team behind Family Origins came together soon after their non-competition clause of their sales contract expired and produced RootsMagic now in version 7.0.8.0. RootsMagic along with Legacy on the Windows platform would seem to be among the companies best able to benefit from Ancestry's recent announcement. RootsMagic is already moving into the breach this evening with a special offer to FTM users. 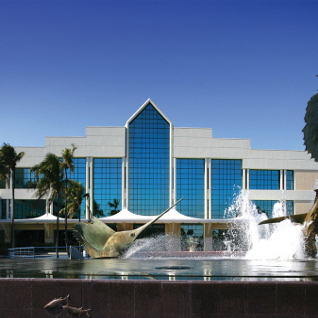 Reunion is in a position to have a similar opportunity for those using FTM on the Mac platform. This decision by Ancestry should not lead to the destruction of useful genealogical data as the corporation's previous decisions to withdraw access to MyFamily.com sites did a couple of years ago. Access to yDNA and mtDNA test data conducted by Ancestry and by Sorenson Molecular Genealogy Foundation (SMGF) was also lost to the genealogical community and those who had contributed it when Ancestry decided to concentrate on autosomal DNA. Taken by itself the decision announced today does not seem to be as damaging to the genealogy community as some of Ancestry's previous actions. However, it leaves this blogger wondering what if anything we should expect when Ancestry acquires former competitors such as Fold3, and Find A Grave? What should we expect from Ancestry's strategic alliances to make other databases available to its customer base? In the first year of the Obama administration much attention was focused on affordable health care. Late that year 23andMe came to my attention when it sought out beta testers for its genealogy application the company was adding to its existing DNA tests for consumer health information. My wife and I quickly signed up and got what, in retrospect, became one of the greatest consumer bargains of all time. My primary motivation for testing was for family history information, but I soon became an advocate for enabling better health care by allowing citizens to "buy" reliable genetic information that might help them understand their current and future health prospects. the presence or absence of 53 "specific genetic variants that can cause certain health conditions" being "carried" down to offspring. We generally didn't articulate these reports from 23andMe as having these 4 components. We thought of them as constituting the health report as opposed to the ancestry report that gave us information about our ethnic origins and offered us a chance to connect with unknown relatives who might help us fill in gaps in our family histories. It was only after the FDA took these reports from the marketplace in November 2013 and eventually allowed one of them to come back in 2015 that we began to realize how much we had lost. Note: 23andMe has recently marketed the original full health reports in other English speaking countries who are not protected by the US FDA. The FDA never presented concrete evidence of actual harm done to consumers by the 23andMe health reports. The agency never alleged that the lab work was substandard or that the company did not really test what it claimed to test. All that the FDA took exception to was the interpretation of the results without the direct involvement of a health professional. The agency alleged that the average citizen might not be able to understand 23andMe's interpretation of the results. 23andMe was mandated to validate that its explanations could be understood on a case by case basis. I wish the FDA would apply the same standards to the drug adds that inundate us every evening during the national news. We are one of 2 countries that allow this kind of promoting prescription drugs directly to public. The other country is New Zealand. These advertising costs contribute to the inflated cost of these drugs when they are prescribed. But I digress. Within the last few weeks I have been asked to recommend DNA tests that could give information about the current and future health prospects for mature adults who were beyond child bearing age. Healthspek, a local startup about which I blogged a few weeks ago, offers testing for possible drug sensitivity or in the likelihood of or severity of side effects. However, this test costs as much or more than 23andMe. 23andMe raised their price in October to $199 (from $99). It is likely they are still operating at a loss even with this increase. Our website, un-channeled, states $499. We have sold only one test so far at that price. The website is not generally reached directly. Our marketing efforts (through partners and direct) provide a link with this url: http://pgt.healthspek.com/discount. Try it. Then use the discount code CYBERMONDAY. You’ll see a price of $299. We have the ability to generate codes with varying discounts and private labeling. This gives us the ability to build in (or not) a commission for channel partners. $499 is a high enough ceiling that there is always a meaningful discount. A similar company (www.getcolor.com) offers a genetic test specific to only breast cancer risk for $249. Other examples exist. 23andMe does not do PGT (pharmacogenetic testing). The biggest reason is probably this: The value in PGT is NOT the underlying raw data, it is in the translation of that data to decipherable and meaningful results in prescribing drugs). Part of the cost of our test goes to the production of a patient-specific report that has several components (drug-by-drug metabolizing, gene-by-gene variants, general overview, etc.). In 1st quarter next year this report will be expanded to include traditional (molecular) drug-drug interactions (this is not genetically driven). While this is not genetic it is equally important in the task at hand-prescribing drugs more precisely. 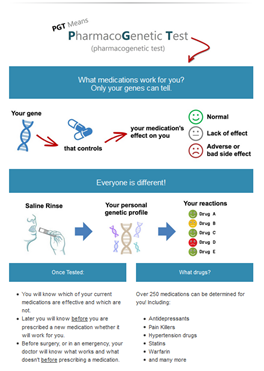 So, our focus of our test – prescribing- goes beyond just raw data and even beyond genetics. Ancestry, carrier markers, some food and wellness. It also has a social (blood relations) aspect that is cool. 1) Complete report – drug-by-drug, gene-by-gene. 2) Telephonic session with certified genetic counselor. 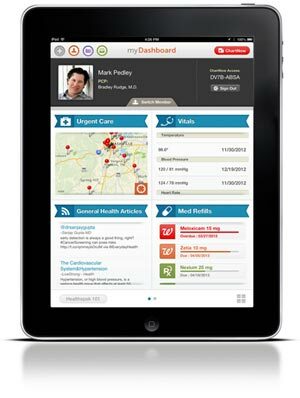 3) Results deposited in free Lifetime wallet –Healthspek, best PHR on the market (per Apple and Appy Awards). 4) Simultaneous delivery of results to consumer’s doctor. 23andMe is a good generalist. But it doesn’t, and can’t, give much help in specific areas that rely on robust research (‘what does this part of the genome mean?’). Genetic Testing is currently available by many companies in the area of oncology, markers, carrier markers, pharmaco, specific diseases, diet, exercise, etc. Companies that do specific genetic testing and results will always have a place in this market. This is because knowledge and its display is what matters, not just the raw data. 23andMe can’t possibly be all things to all people. This is still just one of the 4 areas previously covered by 23andMe reports. The FDA has cleared 23andMe to resume providing most of its "carrier status" reports. These tell one whether you are likely to transmit to your offspring conditions that are not manifested in you or your spouse. So between 23andMe and Healthspek, two of 23andMe original areas of health information are covered. That still doesn't provide feedback on genetic impact that may affect the health of an adult except for drug interactions--information provided by 23andMe prior to November, 2013. Biomedical researchers, healthcare practitioners and customers of DNA testing services (such as 23andMe, Ancestry.com, FamilyTreeDNA, etc.) 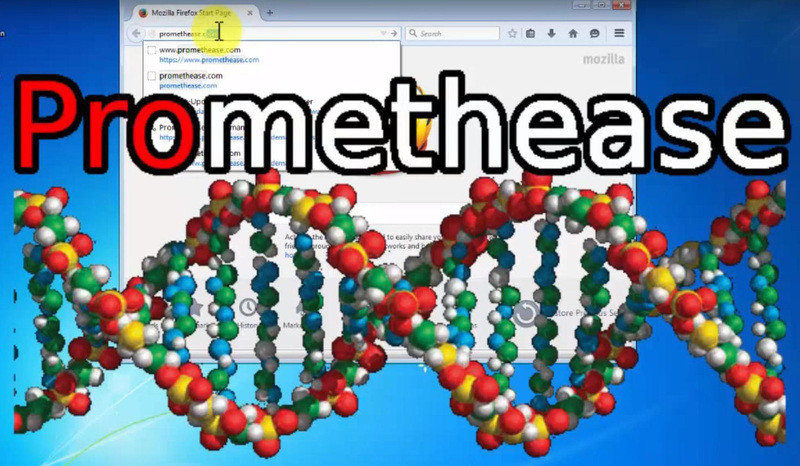 use Promethease to retrieve information published about their DNA variations. Most reports cost $5 and are produced in under 10 minutes. 23andMe announced yesterday a temporary price reduction to $149. One quipster commented that he didn't know if this was a $50 price increase from 23andMe's recent price of $99 or a $50 reduction from the current $199 price. In any case if you are interested in buying a 23andMe kit in the US now is the time to act. It is hard to predict how the current series of changes will affect the utility of the 23andMe product for serious genetic genealogists. Hopefully that will become clearer in coming weeks. The more things change the more they stay the same. In late 2009 my wife and I bought 23andMe kits as beta testers for their new genealogy matching service for $149. That was half the regular price at the time. As most of you readers know the price has fluctuated over the last 6 years. we’ve seen several announcements by companies trying to lure consumers to learn about their genomes. Something they all have in common: they’re losing money doing it, at least for now. As we approach the last year of the Obama administration, are we closer to affordable health care and precision medicine? I hope so. We can't stick our heads in the sand any more when it comes to learning about using DNA testing in genealogical research. We can't ignore the value of genetic testing as a research tool. Let's learn how to use it! She then presented a robust list of resources for getting started in and keeping up-to-date in genetic genealogy. 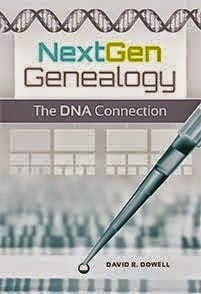 I was very gratified that my recent NextGen Genealogy: the DNA Connection was one of four books listed in her section for "a good way to gain a basic understanding of the fundamentals of genetic genealogy." 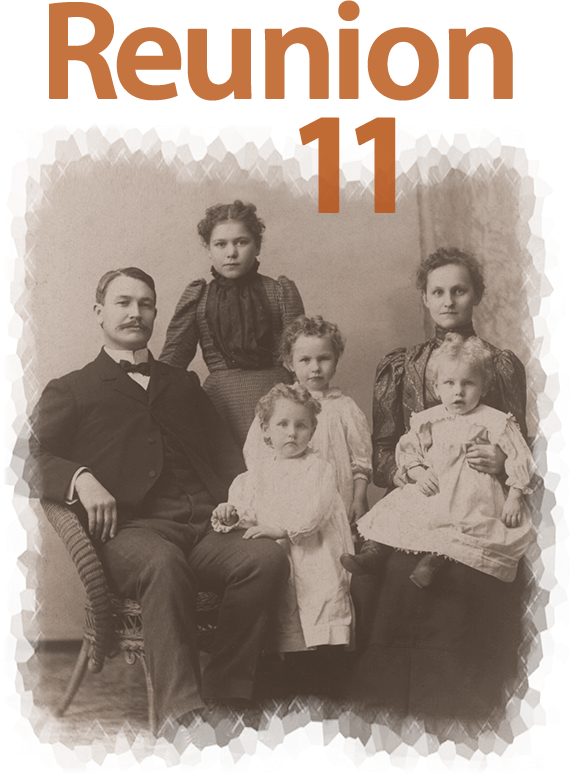 In addition this blog, Dr D Digs Up Ancestors was among the essential blogs to "help us stay on top of the newest developments." Let the learning begin/continue! I know that is why I write and lecture. If I ever feel I am not learning, I'll stop writing and lecturing. Judy's is not a static list. It already has had additions offered in the comments section since it was published yesterday morning.